Revenge of La Nina - Hi, friend Climate and Weather Information, in this article entitled Revenge of La Nina, we have prepared this article well and concise to be easy to understand for you to read and can be taken inside information. hopefully the contents of the post that we write this you can understand and useful. okay, happy reading. 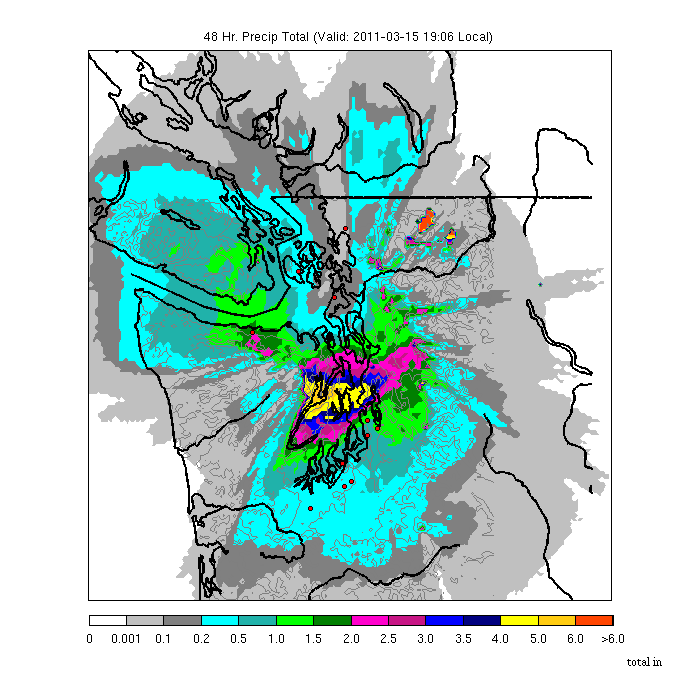 Putting aside the cross-Pacific radiation issues for this blog (again, absolutely no reason to be concerned here on the West Coast), we have had notable very heavy precipitation during the past several days. Slides have stopped north-south train traffic, strong thunderstorms with thunder and lightning have pummeled the lowlands, and some mudslides have blocked local roadways. Slides on the rail right of ways has become a major problem--take a look at the video on the side bar (to the right) to view a typical NW landslide on to the tracks between Seattle and Edmonds. Lets start with the precipitation over the last two weeks at Sea-Tac (see graph): roughly twice normal--so half way through the month we have "enjoyed" a normal whole month's total. Here is the cumulative precipitation (top figure) this season for the Cedar/Tolt rivers (the main water supply of Seattle). Yes, we are ahead of normal (consistent with La Nina). The bottom panel shows snowpack for these watersheds--rapidly catching up to normal after being well below normal. You will be able to water your lawn this summer. An amazing 4 to 6 inches from north Seattle westward. No wonder there were slides on those tracks! For days we have been getting very heavy bands of convective showers moving through. Take today at 2:30 PM (see below). Lots of yellows (heavy rain) and even some reds (downpour and or hail). 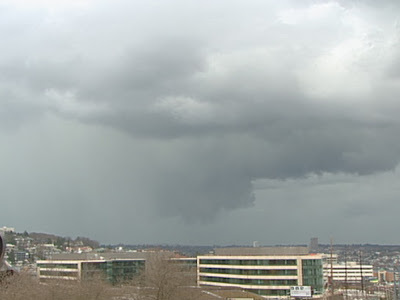 One very heavy thundershower moved through this afternoon and an image shown on the KOMO-TV website (reproduced below) strongly suggests a rotating "wall cloud". 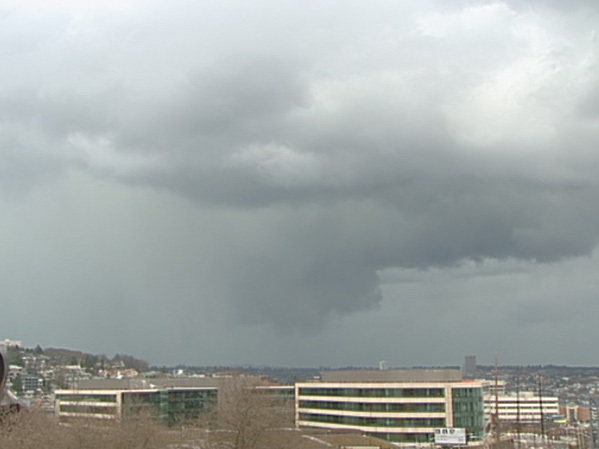 I would not be surprised at all if someone saw a funnel coming out of this feature. More rain tomorrow...but believe or not, Thursday and early Friday should be dry! Returning briefly to the tsunami issue...it turns out that my idea of building safety towers has been considered for a long time (should have known)...it is called vertical evacuation. There are a few projects being considered on the Oregon and Washington coasts...but nothing sufficient to deal with the problem. What will it take to make the investment to build enough vertical evacuation facilities to have a hope of saving most of our coastal population in case of NW tsunami? This is also homeland security--for a fraction of the funding used to building that fence along the Mexican border we could protect all our coastal folks. Thank You and Good article Revenge of La Nina this time, hopefully can benefit for you all. see you in other article postings.